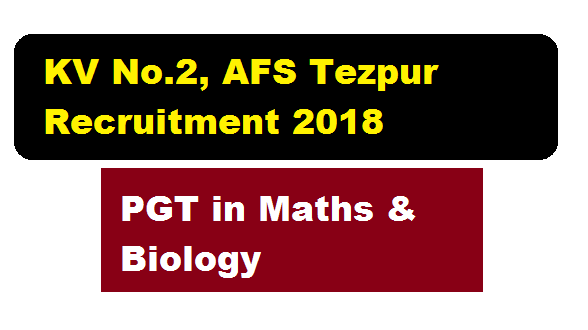 KV No.2, AFS Tezpur Recruitment 2018 , Post Graduate Teacher (PGT) vacancy in Mathematics & Biology :- Good news for Post graduate people. KV No.2, AFS Tezpur Recruitment 2018 latest notification is out for post graduate teacher in various subjects. According to the latest KV No.2, AFS Tezpur Recruitment 2018 July notification, In order to empanel teachers on contractual basis for the session 2018-19 a walk in interview for PGT(Bio) and PGT(Maths) will be held at KV No.2, AFS Tezpur. In this section, we will discuss in detail about Recruitment of PGT under KV No.2, AFS Tezpur Recruitment 2018 with all the details and requirement. 1. Two years Integrated Post Graduate M.Sc. Course of Regional College of Education of NCERT in the concerned subject. b) PGT (Biology) – Botany/ Zoology/Life Sciences/ Bio Sciences /Genetics/ Micro Biology/ Bio Technology/ Molecular Bio/ Plant Physiology provided they have studied Botany and Zoology at graduation level. 2.B. Ed. Or equivalent degree from recognized University. 3.Proficiency in teaching in Hindi and English media. Relaxation of B. Ed qualification: Post Graduate with 60% marks in Science subjects may be considered for the posts of PGTs, if suitable candidates with B.Ed are not available. Eligible & interested candidates may submit the Bio Data form completed in all aspects that is available on the Vidyalaya website on 25.07.2018. Bring all the originals testimonials along with self-attested Xerox copies and 02 (two) passport size photograph on the date of interview.